NORMAN — The University of Oklahoma will transfer ownership of a painting looted by Nazis during World War II to a French woman under terms of a settlement agreement announced Tuesday. 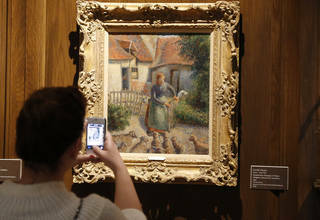 The painting, Camille Pissarro's “Shepherdess Bringing in Sheep,” will be transported to a yet-to-be-named French museum this summer, where it initially will be displayed for five years, attorneys for both sides confirmed. After the five-year period, the painting alternately will be displayed for three-year intervals at the Fred Jones Jr. Museum of Art in Norman and a museum in France, attorneys said. A label describing what is known now of the painting's history will accompany it during future displays. OU President David Boren said Tuesday that he was glad an agreement could be reached with Leone Meyer, heir to the estate of the family that owned the painting when it was stolen by Nazis. OU student Eric Sundby, chairman of the Holocaust Remembrance and Restitution Foundation, expressed joy that Meyer was finally going to receive title to the painting. “Shepherdess Bringing in Sheep” was part of a large collection owned by Jewish businessman Raoul Meyer before World War II. It was looted by Nazi soldiers during the German occupation of Paris as part of a looting campaign that stretched across Europe. After the war, the painting changed hands several times, eventually coming to OU in 2000 as part of a collection bequeathed to the Fred Jones Jr. Museum of Art by Clara Weitzenhoffer, the widow of Oklahoma oilman Aaron Weitzenhoffer. Raoul Meyer's adopted daughter, Leone Meyer, who is in her 70s, sued the university to recover the painting. The settlement agreement acknowledges Leone Meyer's inheritance rights to the painting. It also acknowledges that the Weitzenhoffer family acted in good faith in acquiring the painting and transferring it to OU. Pierre Ciric, Meyer's attorney, said he was grateful to Oklahomans and the Oklahoma Legislature for their support in helping his client obtain title to the painting. State Rep. Paul Wesselhoft and former state Rep. Mike Reynolds, who had pushed for OU to give the painting to Meyer, held a news conference with Sundby at the Capitol on Tuesday. They lambasted Boren and OU for failing to act more quickly to give up the artwork. “This whole thing has been held up by one person and one person only, and that's David Boren,” Reynolds said. It took three years to resolve the dispute, but Meyer's attorney said it is actually rare for disputes over Nazi-stolen art be be resolved that quickly. It's not unusual for such legal disputes to go on for 10 years, he said, because litigation can get complicated when artwork has changed hands multiple times and rightful heirs must be verified. “It's hard to create settlements ... when you have such an emotionally charged situation,” Ciric said. Title to the painting will be transferred to Meyer without any money being paid. Wesselhoft said he understands the painting was once valued in the range of $600,000 to $650,000, but said he believes it is probably worth a lot more now because of all the controversy that has surrounded it. Under terms of the agreement, Meyer is required to make a gift of the painting to a mutually agreed upon art institution in France either during her lifetime or as a testamentary gift. The museum of choice must agree to certain conditions that include facilitating alternating displays of the painting in France and at the Fred Jones Jr. Museum of Art in Norman. The initial five-year display of the painting at a French museum is to begin no later than Aug. 1. If Meyer and OU can't agree on a museum by that time, the painting will initially be displayed in France through the U.S. Art in Embassies program. Private funds from Oklahoma parties will pay the initial cost of transporting the painting to France and the cost of each of the return trips to Oklahoma, The Oklahoman was told. Meyer or the mutually agreed upon French art institution will pay for transporting the painting to France on all but the first trip. Private Oklahoma funds also will pay for insuring the painting while it is at the Fred Jones Jr. Museum of art and when it is being transported to and from France. Meyer or the selected French museum will pay for insuring the painting while it is in France. The agreement prohibits either Meyer or OU from selling movie, television or other commercial rights to the story about the legal dispute over the stolen painting without permission from the other. If such rights ever are sold, proceeds are to be split evenly between Meyer and the Oklahoma parties to the lawsuit. The settlement prohibits Meyer from selling the painting unless she obtains permission from the Oklahoma parties to the lawsuit, which include The Board of Regents of the University of Oklahoma, Boren in his role as university president and the University of Oklahoma Foundation. All pending litigation over the painting is to be dismissed as part of the settlement. Each side is to pay its own attorney fees. All of OU's attorney fees have been paid with private funds, officials said. While the agreement concludes this lawsuit, there could be future lawsuits involving claims that other artwork donated to OU may once have been looted by Nazis. Wesselhoft and Reynolds both said they are suspicious of the provenances of a number of other paintings acquired by the university's foundation and said that has created an embarrassing situation for OU. Mark A. White, director of the Fred Jones Jr. Museum of Art, has previously stated that provenance accuracy is an “utmost priority” at the Fred Jones Jr. Museum of Art.